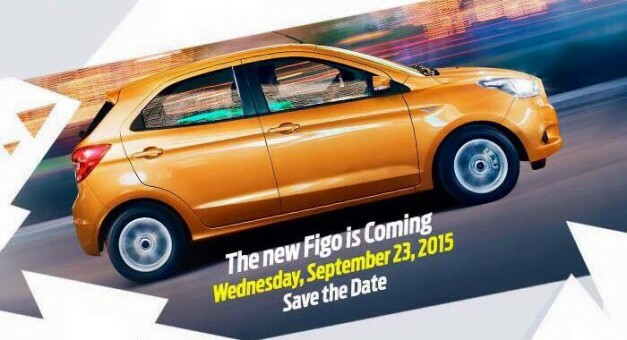 It looks like the Ford Figo hatchback will be launched next-week on September 23, 2015, as revealed by SVP (Siddharth Vinayak Patankar) on his official Facebook page ‘The Car & Bike Show’. The Figo hatchback will inherit its design, hardware and features inside-out from the recently launched Figo Aspire sedan. The highlight of the hatchback is the sporty rear fascia with a raked windshield, a character line connecting tail-gate and a sculpted bumper, even the tail-lamps are borrowed from its booted sibling, overall, the Figo hatchback actually manages to look balanced, relatively. Step-inside, you’ll notice the major change compared to the Figo Aspire, all-black interior with silver accents to spruce things-up against the sedan’s dual-tone beige-black appointments. However, the equipment level will be common and highlights include Ford SYNC 2.0 infotainment system, multifunction steering wheel, automatic climate control, dual front airbags, reverse parking sensor, and alloy wheels. Power-train too will be shared with its sedan counterpart. A 1.2-litre Ti-VCT petrol and a 1.5-litre TDCi diesel, both paired to a 5-speed manual transmission, although unconfirmed at this point there are possibilities of Ford considering a 1.5-litre Ti-VCT petrol mated to a 6-speed PowerShift automatic transmission on the hatchback.